6 Serial ATA (SATA) ports - 4 of 6Gbps and 2 of 3Gbps (Intel C224). 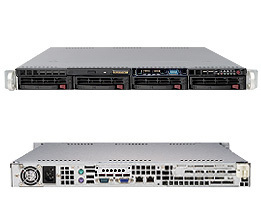 2x Intel® i210AT Gigabit Ethernet, Supports 1000BASE-T, 100base-T RJ45 output. Up to 10 USB (Universal Serial Bus) ports (4 on front panel, 2 x v3.0 + 2 x V2.0). VGA - On-board C224 graphics. No floppy port, no IDE port. IPMI 2.0 with Dedicated LAN port, remote KVM, remote management. 4 of 3.5" HDD bays ( w/ backplane SAS/SATA2). ** if change to DC input 410W power supply, add cost $115.